PPS™ is a complete painting system from 3M™ which produces cleaner jobs, saves on solvent usage and gun cleaning time and can improve operator efficiency by as much as 15%. Specifically designed adapters allow painters to use the PPS™ system with virtually any spray gun. PPS™ replaces traditional mixing cups and filters and drastically reduces the amount of solvent required for gun cleaning. The liner, lid and built-in filter are all disposable, leaving only the adapter and spray gun to be cleaned. It is possible to clean your paint gun with as little as 3 ounces of solvent. With these disposable parts, shops can see a 70% savings in cleaning solvent use -- meaning less operator exposure to solvents and reduction in VOCs. Since PPS™ uses the same cup for mixing and spraying, there less risk of outside contamination, less time spend mixing and cleaning. With PPS™ your spray gun functions at any angle Many painters mix more paint than they need to reduce the chance of starving the gun. PPS™ allows painters to spray at any angle without starving the paint gun. Kit contains 25 disposable lids with 200 micron filters, 25 liners, and 10 sealing plugs. The 200 micron filters are recommended for traditional solvent based paint or primer applications. PPS™ is a complete painting system from 3M™ which produces cleaner jobs, saves on solvent usage and gun cleaning time and can improve operator efficiency by as much as 15%. Specifically designed adapters allow painters to use the PPS™ system with virtually any spray gun. PPS™ replaces traditional mixing cups and filters and drastically reduces the amount of solvent required for gun cleaning. The liner, lid and built-in filter are all disposable, leaving only the adapter and spray gun to be cleaned. It is possible to clean your paint gun with as little as 3 ounces of solvent. With these disposable parts, shops can see a 70% savings in cleaning solvent use -- meaning less operator exposure to solvents and reduction in VOCs. Since PPS™ uses the same cup for mixing and spraying, there less risk of outside contamination, less time spend mixing and cleaning. With PPS™ your spray gun functions at any angle Many painters mix more paint than they need to reduce the chance of starving the gun. PPS™ allows painters to spray at any angle without starving the paint gun. 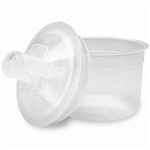 Kit contains 50 disposable lids with 200 micron filters, 50 liners, and 20 sealing plugs. The 200 micron filters are recommended for traditional solvent based paint or primer applications. NOTE: The product image shows the Cup with a 3M Mix Ratio Insert installed. 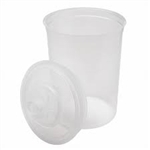 3M Mix Ratio Inserts are not included with Cup and Collar packaging. 3M 16000 PPS Standard Size Kit 50 Lids and Liners, 25 Caps, The 3M Paint Preparation System (PPS) is a unique, closed paint system which eliminates the need for separate mixing cups and filters. Instead, paint is mixed in a liner bag which marries to a direct filter and is then mounted on the spray gun with a dedicated adapter. As freshly filtered paint is dispensed, the liner bag collapses, allowing the spray gun to function at any angle. Liner bag and filter are disposable, leaving only the spray gun and adapter to be cleaned. 3M PPS is therefore a cleaner, faster system, safe from outside contamination and offering considerable time and solvent savings on gun and parts cleaning. Only one 3M PPS cup for mixing and spraying. Closed system - no outside contamination. Up to 70% savings of cleaning solvent. Less operator exposure to solvents and reduction in VOCs. Faster system - from mixing to disposal. Spray gun functions at any angle. 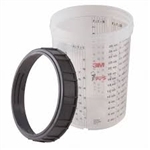 Small, hard cup that supports and holds the PPS small flexible liner, part number 16000.